Gorgeous coastline, the world’s highest tides, sensational seafood, huge chunks of wilderness and a cosmopolitan heritage: New Brunswick is a maritime gem. The province’s unmissable natural wonder is the Bay of Fundy, which separates New Brunswick from Nova Scotia. 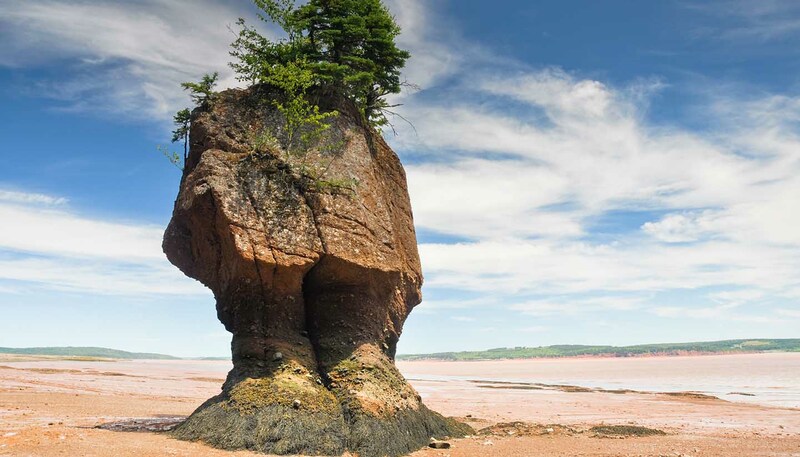 As well as whales, this vast bay boasts the world's highest tide and the best place to watch it is at Hopewell Rocks, a collection of tree-topped sea stacks that disappear before your eyes as the tide rises four stories in a matter of minutes. Away from the seaside, New Brunswick offers outdoor adventure in spades. You can camp, mountain bike and ski in the Appalachian Mountains; kayak and canoe across gentle lakes and churning rapids or hook salmon the size of small dogs on the Mirimachi River. Not surprisingly for a province more than half-wrapped in coastline, New Brunswick’s seafood is pretty special. Delve into platefuls of oyster soup, lobster stew, or anything flavoured with dulse, a type of edible seaweed. New Brunswickers love to show off their heritage; English, Scots, Irish and French have all made their mark here. You might stumble upon bagpipers giving it laldy at a Scottish Highland Games or find yourself tapping your toes to a barnstorming Irish dance performance. Middle Island Heritage Park recounts the sobering story of immigrants fleeing the potato famine who were quarantined on this island, many of whom never made it off. Nearly a third of New Brunswickers are French speakers, so dust off your dictionary and get chatting to New Brunswick’s Acadians. The Village Historique Acadien is jam-packed with costumed characters guiding you through their history, but you can have just as much fun nattering in an Acadian village bar with a glass of the local vino. 72,908 sq km (28,150 sq miles).